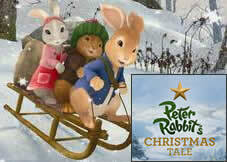 A new animated adventure featuring Peter Rabbit, Benjamin Bunny, and a brand new friend, Lily Bobtail. First aired 20th December on CBeebies, and again on Christmas Day on BBC One. Currently recording Season 1 (26 episodes). Characters played; Mrs. Rabbit, Flopsey, Mopsey, Cotton Tale. UK Version.